1. A bitter, abusive criticism, a verbal attack, or a denunciation: The editor scrawled a scathing diatribe on the reporter's article before it was printed in the newspaper. 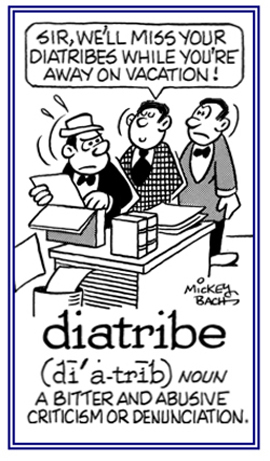 The President has expressed many diatribes against various medias; including television, radio, and some newspapers. 2. 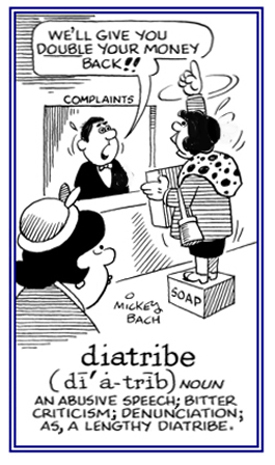 Etymology: the Greek word diatribe, the ultimate source of the English word, is derived from the verb diatribein, made up of the prefix dia-, "completely", and tribein, "to rub, to wear away, to spend," or "to waste time, to be busy". © ALL rights are reserved. 1. A method of rapidly separating electrolytes from colloids by dialysis or by passing a current through a solution containing both elements. 2. A process in which an electric field transports ionized material through a membrane to separate it from other liquids or ions of opposite charge. 3. A system that uses electrical current applied to permeable membranes to remove minerals from water; for example, to desalinate salt water or brackish water. 1. A procedure for removing metabolic waste products or toxic substances from the bloodstream by dialysis. 2. Dialysis of the blood to remove toxic substances or metabolic wastes from the bloodstream; used in the case of kidney failure. 3. The removal of certain elements from the blood by virtue of the difference in the rates of their diffusion through a semipermeable membrane. Two distinct physical processes are involved, diffusion and ultrafiltration; also called, dialysis, kidney dialysis, and renal dialysis. The longer of two diagonals, as of a rhombic prism. 1. Detachment of the retina. 2. Disinsertion of the retina; detachment of the retina at its peripheral insertion.